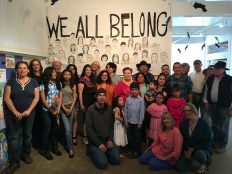 Gallery Route One’s Artists in the Schools and Latino Photography Project present their Annual Art installation at Toby’s Feed Barn Art Gallery, 11250 Highway One Point Reyes Station through June 30. Don’t miss this great show! Finding Meaning is the theme for both the AIS program and LPP program exhibitions encouraging the artists to find meaning and goodness in their daily lives using many different art forms. We hope you will find meaning in our annual installation at Toby’s Art Gallery this June. Gallery Route One’s Artists in the Schools program encourages young people to specify and amplify what is meaningful in the students’ lives — food, clothing, family, community engagement, safety, friendships and shelter — as well as the qualities they value and don’t value in friendships. This is a yearlong program that collaborated with classroom teachers and enrichment staff working with the AIS program. 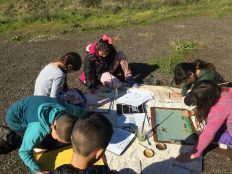 This year we worked with the World Story Exchange, Point Reyes National Seashore, Poets in the Schools and others to explore this theme. Our instructors include: Vickisa, Joe Fox, Sandy Curth, Lindsay and Scott Miller, Brian Kirven, Leslie Adler Ivanbrook, Amaris Blagborne and Madeline Nieto Hope. Gallery Route One’s Latino Photography is in its 13th year embracing two programs, an adult photography class and classes for youth as an in school elective and an afterschool program. Many of the themes involved bridging the cultural divide — showing the ethnic and socio-economic make-up of Main Street, visiting homes of both Anglos and Latinos to learn about housing problems, gardening, herbal cures, habitat restoration, or recipes from our grandmothers. Through such meetings, and the resulting photos and text, Latinos and Anglos have come to know one another and to see commonalities.